Here’s a mostly-complete listing of the hikes, paddles, daytrips and other outings I’ve done so far in 2013. I keep this list to help remind me about where I’ve been so far this year; it also helps motivate me when too many days have passed between updates. Dec 31 – Hiked Shaw Butte with Wayne and ran into Danielle at the summit. Dec 28 – Bagged the “Six Summits of Shadow Mountain” with Wayne. Dec 27 – Dayhiked to Dripping Springs via Coffee Flat Trail in the Superstition Wilderness with Dan and Danielle. Dec 26 – Hiked Holbert Trail with Wayne in South Mountain Park. Dec 25 – Christmas hike with Mom in the Spur Cross Ranch Recreation Area. Dec 22 – Short loop hike with Kandra in the Phoenix Mountains. Dec 19 – Sunset hike with Danielle around Dreamy Draw in the Phoenix Mountains. Dec 14 – Afternoon solo hike around Dreamy Draw in the Phoenix Mountains. Dec 13 – Short solo lunch hike in the Phoenix Mountains. Dec 1 – Hiked Cave Creek Trail with Dan and Danielle. Nov 29 – Black Friday hike with Becci on Go John Trail in Cave Creek Regional Park. Nov 28 – Thanksgiving Day hike with Mom in Phoenix Sonoran Preserve. Nov 18 – Night hike with Tiffany in the Phoenix Mountain Preserve, followed by a second solo night hike. Nov 11 – Hiked the Black Mesa Loop in the Superstition Wilderness with Dan and Danielle. Nov 3 – Sunset hike in Dreamy Draw with Jenny, Dan, and Danielle. Nov 2 – Hiked the Garden Valley Loop in the Superstition Wilderness with Jenny. Oct 27 – Hiked the Steelhead Falls WSA in Oregon as part of the 2013 Friends Rendezvous. Oct 21 – Evening hike in the Phoenix Mountains with Danielle. Oct 14 – Hiked to some old mine shafts in the Phoenix Mountains with Dan and Danielle. note: I’m not including items from August 7-14 while I was on my #RustBeltRoadTrip. June 24 – Solo sunset hike in the Phoenix Mountains. June 23 – Night hike in the Phoenix Mountains with Dan and Danielle. June 22 – Kayaked the lower Salt River with Ava. June 17-19 – Rafted the San Juan River between Bluff and Mexican Hat, Utah with colleagues. May 30 – Visited Walnut Canyon National Monument with Mom. May 26 – Kayaked the lower Salt River with Paddle Arizona from Saguaro Lake Ranch to Granite Reef Dam. May 19 – Hiked the trail at Three Rivers Petroglyph Site with a side stop in Carrizozo. May 17 – Hiked the Pine Tree Loop in the Aguirre Springs Recreation Area, part of the proposed Organ Mountains-Desert Peaks National Monument with a side trip to the Aden Lavabeds area. May 16 – Explored another section of Rio Grande del Norte National Monument. May 15 – Took some short walks in Rio Grande del Norte National Monument. May 5 – Hiked the Horton Springs trail with Larry and Mom during a daytrip up to the Mogollon Rim. May 4 – Great evening hike with Larry in the Phoenix Mountains. May 3 – Early morning kayak on Lake Mead with Chuck and Pam. May 2 – Early evening stroll through the Grand Wash Cliffs-Joshua Tree Forest with Chuck and Pam. May 1 – Short windy kayak paddle on Lake Mead National Recreation Area with Chuck and Pam. Apr 30 – Quad ride on Grapevine Wash Road to the Lake Mead National Recreation Area boundary with Chuck and Pam. Apr 25 – Evening hike with Trail Mix meetup group to two old mercury mine shafts and a stone hut in the Phoenix Mountains. Apr 23 – Did an evening hike up North Mountain with the Trail Mix meetup group. Apr 22 – Quick hike in the North Mountain/Shaw Butte area with Jenny, including eluding a large swarm of bees. Apr 21 – Spent a couple of hours hiking with mom on Trail 8 in the Phoenix Mountains. Apr 11 – Short walk in the Phoenix Mountains off 40th Street. Apr 7 – Day hiked Aravaipa Canyon Wilderness Area with Dan—a trail that’s been on my list for decades. Mar 31 – Hike with Mom in the Phoenix Mountains off 40th Street Trailhead. Mar 30 – Hike with Jenny in the Dreamy Draw area. Note: I’m not including any items here between Feb 27 and Mar 19 while I was on my #BattlefieldsandBeginnings road trip. Feb 22 – Trudged off-trail to visit some petroglyphs and ruins in Agua Fria National Monument with Betsy and Mackenzie. Feb 18 – Took Sipapu for a hike at Shadow Mountain Preserve—amazingly, the first time I’ve finally visited the second closest mountain preserve to my house. Feb 17 – Hiked in the Estrella Mountain Regional Park with Jenny. Feb 15 – Short hike with Sarah at Gateway Trailhead of McDowell Sonoran Preserve. Feb 10 – Hiked around Hackberry Springs in Superstition Wilderness with Sarah. Feb 7 – Hiked the Ben Avery Trail in the Eagletail Wilderness with John. Feb 3 – Hiked in Phoenix Mountains with Jenny. Jan 31 – Hiked Margie’s Cove Trail in North Maricopa Mountains Wilderness of Sonoran Desert National Monument with Mackenzie. Jan 27 – Hiked in rainy Phoenix Sonoran Preserve with Sarah. Jan 26 – Short solo hike in cloud-enshrouded Phoenix Mountains Preserve. Jan 24 – Took a short walk in Rio Grande State Park in Albuquerque with colleagues. Jan 17 – Snowshoed on Chickadee Ridge outside Lake Tahoe with colleagues. Jan 13 – Hiked near North Mountain with Danielle. Jan 12 – Mountain biked in the Phoenix Mountain Preserve with Dan. Jan 10 – Visited Murray Springs Clovis site in San Pedro Riparian NCA with colleagues. Jan 6 – Hiked North Mountain with Danielle and Jenny. 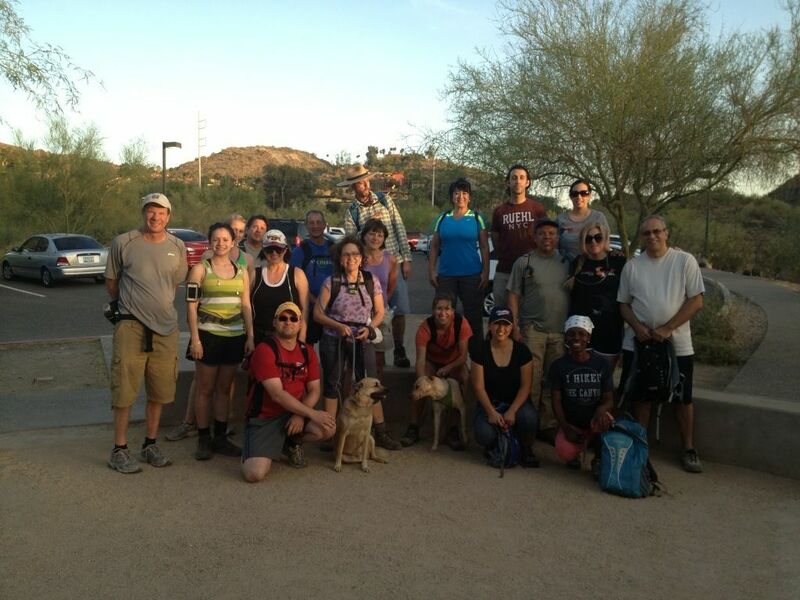 Jan 1 – Hiked the 5.8-mile Go John Trail in the Cave Creek Regional Park with a few friends.